The Kamaron® Institute (www.kamaron.org) KC3™ Positive Label Program is a research-based, six-week, Positive Character and Bullying Prevention Program proven to decrease name-calling, discipline and distraction incidents in schools and buses, while increasing kindness and cooperation. 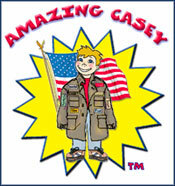 KC3™ Positive Label Program has been an education resource of the National Museum of Patriotism since 2002. The National Museum of Patriotism (www.museumofpatriotism.org) is a nonprofit organization dedicated to educating our country’s youth, celebrating personal achievement, motivating people to respect the rights of others, to help our neighbors, to inspire good, and to magnify love of one’s country. It houses the Georgia Center for Character Education. National Museum of Patriotism KC3™ Citizenship in Motion Award: Established in 2005 by museum founder Nick Snider, is an annual performance-based, national Citizenship Award Program recognizing outstanding achievement and continuing commitment in the areas of positive citizenship and character education through the implementation of the Kamaron Institute KC3™ Positive Label Certification Program. A District Of Excellence awards category is scheduled to be added in 2010. © 2005-2009, Kamaron Institute, All rights reserved. Program is subject to change.